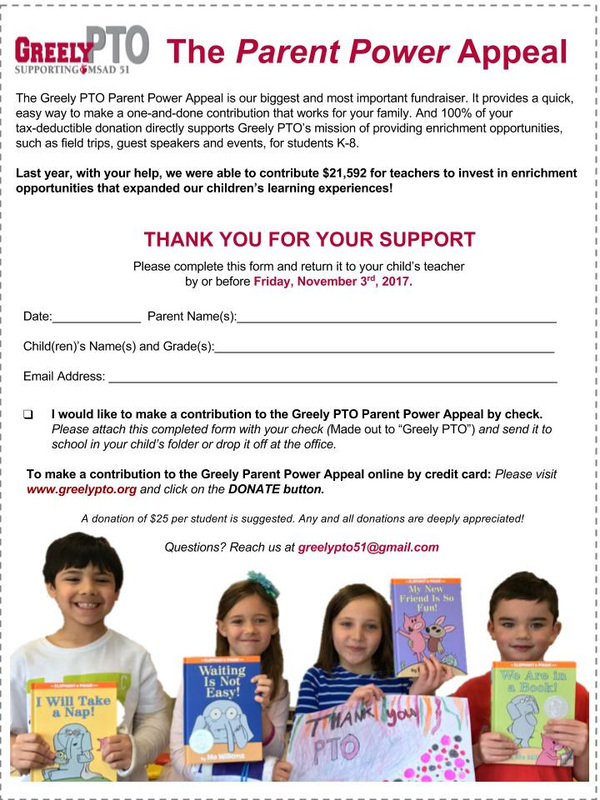 Greely PTO - We Need Your Parent Power! Last year, Greely PTO contributed $21,592 for teachers K-8 to invest in enrichment opportunities for their students that complemented their lesson plans. From field trips to educational guests, like musicians, artists and authors, these funds helped expand our kids' learning far beyond their classroom walls. Greely PTO also created and contributed to more than 20 family and school events last year that make our school community feel more vibrant. Thank you for considering a gift to our biggest and most important fundraiser - the Parent Power Appeal. Our goal this year is to raise $10,000. This form pictured is going home in your child's folder today. You can send it back to the school with your donation check or make your gift online.